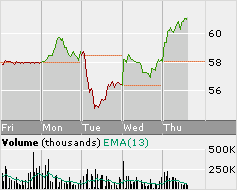 we added AGU at $58 , bought more on the dip to $55. now above $61 .... we win! .... BOTD loves 5% and 10% gains! Wish I would have rode this one with you, now I gotta hope for the dip to buy.